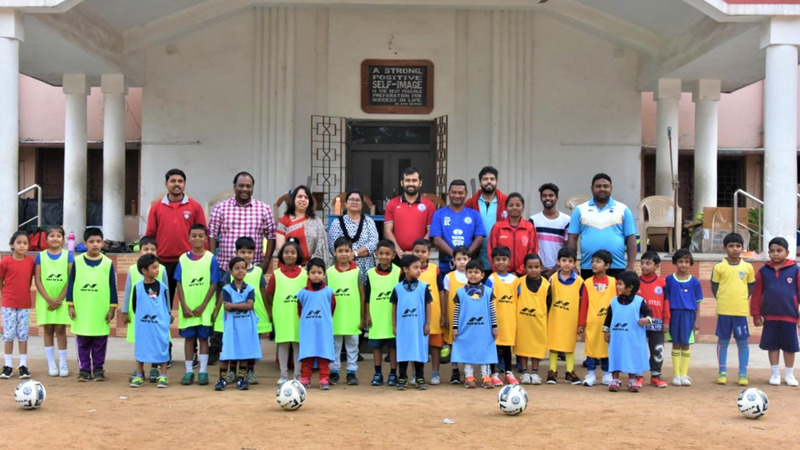 Jamshedpur Football Club, in collaboration with DBMS High School, Kadma has launched its fourth football school keeping in line with the vision of the club’s Grassroots Programme. Since its inception Jamshedpur Football Club has made a commitment to develop football in the local region. Whether it be promoting grassroots football or establishing football schools, the goal has always remained the same which is to promote football in the community and bring forward local talent by establishing a strong foundation. The school was inaugurated by DBMS Principal, Ms. Meena Bugli and by Jamshedpur FC's Head of Youth Development and Grassroots, Mr. Kundan Chandra. The inauguration was also graced by the presence of Jamshedpur FC's Head of Operations, Mr. Raja Bhattacharjee. Talking about the club's new football school which saw an immense response from the parents and their children, Mr. Kundan Chandra said, "It is great to see the club expand it's football schools to almost every corner of Jamshedpur. I really like how the school and the parents have shown enthusiasm towards football! And we hope to spread this initiative to various schools soon." The DBMS High School Principal, Ms. Meena Bugli was ecstatic with the club's initiative as she said, "We are glad to have partnered with one of the leading clubs in Indian Football. We would like to take this partnership a long way and hope in future one of our children can play for the first team."